Deering-Yuryakh - Parking of the ancient Paleolithic. In 1982, 140 kilometers up from Yakutsk on the right bank of the Lena, geologists prepared for the arrival of guests of the next International Congress of INQUA, a demonstration of the deposits of the most ancient Lena terrace, Tabaginsk, in one of the pits, a human skull was discovered. The age of the finds was determined at 3.5 thousand years. Excavations of another grave led archaeologists to the ancient site of the Duktai culture. Duktais lived in Yakutia 35-10 thousand years ago, about 12 thousand years ago they settled the American continent, passing through the current Bering Strait. However, the main secret of Deering Yuryakh was in front: tools were found from quartzite boulders and pebbles - choppers, scrapers, anvils, bumpers. Here it is, the main sensation of Deering-Yuryakh - the finds were like two drops of water similar to the most ancient ones found in East Africa: in Tanzania, Kenya, Ethiopia. There they were 2.5-1.7 million years old. Complex archaeological and geological studies have shown that the tools of Dilling culture of the ancient Paleolithic are, in fact, not inferior in age to those found in the tropical zone. But if there our ancestors lived in a hot climate, then on Diring, as it turned out, already there was permafrost, and the average annual temperature did not exceed minus 12-14 degrees Celsius, in a word, it was cold. The findings on Diiring Yuryakh made us return to the already forgotten concepts not of the southern, tropical, but of the northern extratropical ancestral home of mankind. And about the impact of extreme, cold environmental conditions on the emergence of man and his culture. Some scientists suggest that about 1.6 million years ago in East Africa a new kind of stone tools appeared. The so-called manual chopper consisted of a piece of stone the size of a fist, which was shaped like a palm or an oblate pear; sharp edges of the stone were formed by chipping flakes from both sides. Experiments show that this tool was used mainly when cutting carcasses, which were previously freshened with sharp stone flakes, which had the form of axes-shaped blades (cleavers). The very first hand-cutters appeared around the same time as Homo Erectus. Since a lot of ingenuity was required to make similar tools of the same type, we can conclude that their probable inventor was precisely this highly developed hominid. The Acheulean tool making technology spread in India and Europe, where it continued to exist about 100,000 years ago. Meanwhile, the culture of making coarser chopping tools (choppers) belonging to that type called Oldowan, spread in Europe and Asia from the Middle East to Java. The most famous ancient instruments are the typical instruments of the "Olduvan culture from the Olduvai Gorge in Tanzania" - choppers and choppers. Here 1.9 million years ago Homo Habilis (or any of the modern Australopithecines) split basalt and quartz pebbles, gave them a shape that is now called coarse choppers (choppers), scrapers, incisors, axes, and, according to their outlines, are divided on discoids, polyhedra (polyhedra) or subspheroids. Some scientists believe that in fact the true tools were not listed forms, and the so-called "junk" fragments, split off from these nuclei. No doubt, 1.5 million years ago, near the Turkana lake in Kenya, hominins used small stone flakes in order to carve the antelope carcasses. Scratches from the teeth, located on the bones of animals under scratches from cutting tools, suggest that the early hominins usually scraped the meat from the carcasses of animals killed by predators. But it is likely that the earliest people also made tools for hunting. The stone balls from Olduvaya, connected by straps, turned into a hunting projectile, which, when thrown, could be knocked down by the antelope, just as cowboys today catch cattle with the help of throwing ball balls. The Aldovan industry (also called chopper-fragmentation or pebble) and its later versions spread widely across a large part of Africa and Eurasia of the early Stone Age. In some places, this culture flourished 200,000 years ago - many years after the invention of more sophisticated techniques. Heaps of rocks and bones found in Olduvai Gorge in Tanzania say that about 2 million years ago, early people were already gathering in groups, where they were killing game, making guns, eating food and building, perhaps, the very first shelters in the world. Pointed stones, chopped and fragmented bones of large herbivorous mammals show that we are not dealing with random gatherings on the river bank, but with workers and even with residential camps, where members of the family of a man skillfully shared food among themselves. They brought here the bones of animals killed by predators, and pieces of lava from nearby mountains to process them in place. Careful research indicates that most of the approximately 20 very early sites in Olduvai were carefully selected where fresh drinking water flows flowed into the game's salty brackish lake. Perhaps the most remarkable discovery was that these ancient people began to build dwellings. In one parking lot, the location of bones and stones indicates that on the windward side people were protected from the wind by a hedge or a shield from a bush. In another parking lot there is a circle of stones about 4 meters in diameter, supporting the branches that have long since disappeared, from which a hut was built, similar to those that are still being built here and there in Africa. This shelter, which is approximately 1.8 million years old, is the first human construction known to us in the world. The report that in Yakutia in the valley of the Lena River a site of the most ancient man, whose age is determined within the limits of 2.5-1.8 million years, has caused great interest among scientists in the world. Honor of the discovery and research of the parking Deering Yuryakh belongs to the spouses, known Yakut archaeologists, academician of the Russian Academy of Natural Sciences and the Academy of Sciences of the Republic of Sakha (Yakutia) Yu.A.Mochanov and the doctor of historical sciences S.A. Fedoseeva, the authors of many solid monographs and discoveries of the Stone Age. Geological and geomorphological study of the area of ​​the Paleolithic site was carried out in a complex manner and it was established that the Deering camp lies in the river sediments of the most ancient terrace of Lena, which is more than 2.5 million years old. The coincidence of the datings of the ancient Diling Paleolithic, obtained by different methods (archaeological, geological-geomorphological, paleomagnetic, etc.) can not be accidental. If this age is correct, then Deering is by far the oldest Paleolithic monument in Eurasia and one of the oldest in the world. Judging by the permafrost manifestations, the ancient inhabitants of Deering, unlike their African contemporaries living in the fertile tropics, had to live in extreme conditions of permafrost at mid-annual temperatures minus 12-14 degrees Celsius. 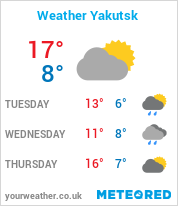 Now in Central Yakutia the average annual temperature is several degrees higher (minus 10.2 degrees). The archaeological materials of Deering, represented by the archaic pebble culture, show the simplest form of the technique of converting stone into tools. On Diring, in the cultural layer, the areas where the boulders were crushed (this technique is the most original stone treatment) are opened and their subsequent piling to obtain tools. The peeling culture of Deering has no signs of better stone processing. All this allows us to reconstruct the first stage of labor processes for the transformation of various natural materials into products. In general, this material testifies to Diring as an archaeological monument of one of the most ancient phases of the instrumental activity of primitive man. If we compare these findings with excavations in East Africa, we can assume that the appearance of a reasonable person almost simultaneously occurred in several independent regions of the Earth, and the appearance phenomenon itself should be considered a special cosmoplanetary process that was not at all conditioned by the natural selection processes known in the biological world , micro and macro mutations, and their inheritance. The phenomenon of Deering is obvious: he forces to change the current scientific vision of the problem of the origin of man. Excavations of the ancient Dealing Paleolithic, which have no analogues in the world (over 17,000 years have been opened over 40 thousand square meters of cultured layer), its numerous cultural remains (more than 5,0 thousand items) are a significant contribution to the world culture. In 1988, the representative All-Union scientific conference "Problem of the ancestral homeland of mankind in the light of new archeological and anthropological discoveries" was held at Diring. In her documents, it was noted that "... the monuments of the Dilling culture of the ancient Paleolithic, investigated by the Prilenskaya archaeological expedition, are not only national but also universal, planetary property. Their comprehensive study can have an important prospective significance in the world science about the origin of mankind, ideas about the general laws of the evolution of the entire organic world. " For the sake of fairness, we note that not all anthropologists of Russia and other states support the hypothesis of Academician Yu.A.Mochanov about the "extratropical forefather of humanity." The age of the site is defined by others as 200-300 thousand years ago. SM Tseitlin write: "You can not build a scheme for the evolution of hominids and their transformation into humans, bypassing the stage of australopithecines. This is well known, and all proponents of the Asian human hypothesis are forced to resort to the search for australopithecines, which have not yet been found even in many more southern parts of Asia. Consequently, there are no biological prerequisites, except for very vague and general ideas about the significance of the "complex problem of anthropogenesis as a cosmoplanetary phenomenon" among supporters of the extratropical ancestral home of mankind. The following circumstance is also alarming. Mochanov show that the climate of Central Yakutia was 3.2-1.8 million years ago the same as today. The probability of life of the most ancient people on Earth in conditions of severe winters and permafrost is very doubtful - it was necessary to build warmed dwellings, have a sufficiently developed organization of life and ways of hunting, etc. Adoption of such a judgment contradicts everything that is known about the earliest Paleolithic sites of the primitive man, his possibilities, the structure of the associations of habilis, and determines this form that stood between the animal world and the world of man as having advanced too far in its development. A man came here from the south, moving along the warmest and most favorable for life, in any case, in the summer, the valley of the Lena River. But when did he come? ... ". Disputes between archaeologists continue. They can be resolved by further excavations and archaeological finds confirming the version of Academician Yu.A.Mochanov and Doctor of Historical Sciences S.A. Fedoseyeva. In favor of the hypothesis of an extratropical ancestral home of mankind, the archaeological expeditions discovered by Prilenskaya in 1995 show evidence. in the valley of the middle Lena, the first Acheulian, ages 1,8-0,2 million years and Mousterian ages 200-40 thousand years, monuments known in Africa, Europe, East Asia and the Middle East. New findings inspire hope that the chronological gap of almost 2 million years of the ancient history of Yakutia in the coming years will be eliminated. They also convincingly show that the historical process of the development of human society in the extremely cold conditions of Yakutia was carried out at approximately the same pace and in one direction of evolutionary development, like Europe, Africa, East Asia and the Middle East. Academician Yu.A. Mochanov in 1992. The monograph "Ancient Paleolithic Deering and the problem of the extratropical ancestral homeland of mankind" was published. Yakut archaeologists have found 13 sites of the ancient Paleolithic, the development of which is waiting for its researchers. Further development of archeology, application of the most advanced technologies and methods of excavations will confirm or refute the hypothesis "about the northern homeland of mankind".